After serving in the US Army, the United Nations peace keeping forces, and the Elfrida Fire Department, Christopher Waters found his true calling in EMS. Helping people in their time of need, easing pain, quelling fears, and saving lives is what he was meant to do. Chris worked at the Sunsites/Pearce Fire Department full time, attaining the rank of Captain, while simultaneously volunteering at his hometown fire department. 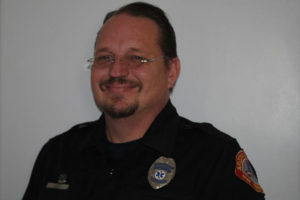 Chris’s EMS career has spanned 20 years, nine of which have been with his second family at Arizona Ambulance. During his service as an EMT for Arizona Ambulance, Chris has proven time and again that he is one of our finest clinicians—bringing to work each day a wealth of experience, skill, and knowledge. Just as importantly, Chris exhibits deep compassion in his patient care, a personal touch that stays with his patients and their families for years. Chris is a natural leader and mentor; he is looked up to by our young EMTs and Paramedics as well as highly respected by his long-time peers. Chris befriends our new employees on their first day with Arizona Ambulance, makes them feel comfortable, and treats them as though they have been with us for months. He shares his clinical knowledge as well as his practical experience without ever acting “superior” or talking down to others. If there is an operational problem that arises, Chris will bring it to leadership’s attention along with two or three solutions he has already thought out. Chris exudes a calm demeanor under high stress situations. He is calm, cool, and organized during critical patient care moments where every second counts, as well as is possessing of excellent and vital communication skills during calls. We are proud to recognize Chris as a Star of Life for his contributions to Arizona Ambulance as well as the entire community.